I am overwhelmed with gratitude for this companies who responded so quickly with a YES! We want to help. Now I'm asking for more help, from you. Sarah updated us yesterday, with words and pictures. I am fighting tears again this morning. While there house was spared she has lost her town. Both of her churches were destroyed, her daughter's preschool, their hospital. Friends and family lost homes. I cannot even begin to imagine what that feels like. Our Help for Joplin auction will go live TOMORROW, WEDNESDAY MAY 25 at 8:00 am. We will be hosting the auction on our Bigger Picture Blogs Page. To make this a success we need to spread the word. Will you blog about the event? Tweet it? Post it on your Facebook page? Make our button your profile pic, it's on all our Facebook Pages. Use your blog or your Facebook page to post about the Help 4 Joplin auction. 1. The site and dates of the auction -- Wed., May 25 through Fri., May 27. When you do head over to Hyacynth's and share you're link. We want you to share both to show Sarah and Joplin our solidarity, how many of us are standing together for them but also to say Thank you. Hyacynth will be giving away a beautiful coffee cozy from A Soft Landing and a gift card to Starbucks to one of you who helps us spread the word. 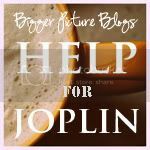 Will you stand with us and Help Joplin? Prayers go out to all of those affected! Will help spread the word! I posted the button on my blog and will spread the word on facebook! Thanks for spreading the news so others will help those in Joplin. CardsDirect is happy to lend support and keeps Joplin in our thoughts for a speedy recovery.